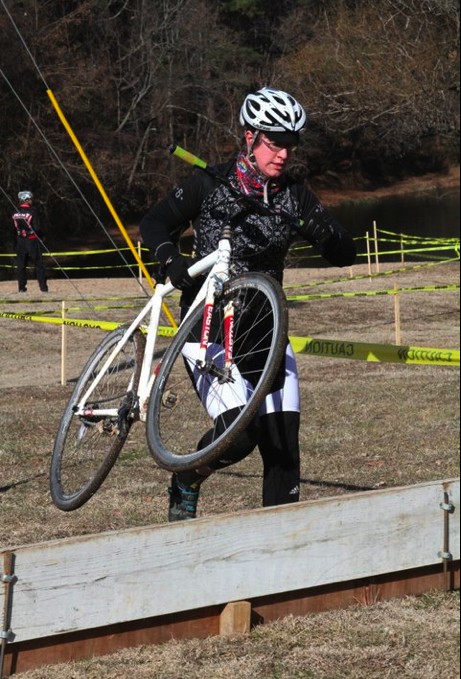 Arleigh racing cyclocross in North Carolina. Arleigh Jenkins, known to some as the Bike Shop Girl, worked in the bike industry for over a decade. From shop rat to manager to wrench on the pro mountain bike circuit, she’s had a hand in nearly every aspect of the cycling world. She’s since moved on from the bike industry, but Arleigh’s used her knowledge to help cyclists empower themselves, first through CommuteByBike.com and more recently BikeShopGirl.com. I spoke to Arleigh about the barriers women (and everyone) sometimes face in cycling, the need for independent bike shops to evolve, and her struggle to get back into the saddle after being hit by a car. I know you’ve been involved in the bike industry for a while. Tell me about your background. 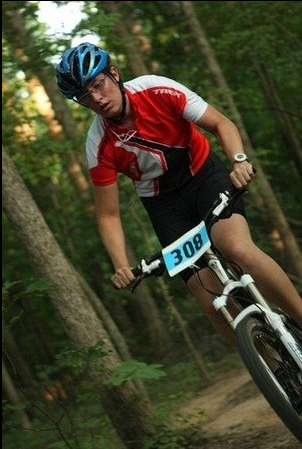 I’ve been within the bike industry since the age of 14. I started as a shop “rat” at a bike shop in Annapolis, Maryland. I worked there for a couple years through high school, got into road racing, followed it down the east coast to South Carolina. Then I continued to push my interest in shops, culture and all the different levels of the bicycle world all over the East Coast. I wanted to experience different types of cities, types of shops and different culture of the bike industry from Boston, MA on the end of a major Rail to Trail, to Adams Morgan in Washington, DC and Philly, Baltimore and everywhere in between. I experienced the messenger lifestyle first hand by fixing their bikes, learning bike locks, and fixies and urban cycling before it was “cool.” Then I got more involved with racing and bike fitting, selling $15k bikes and learning how humans really work on bikes. I worked at Cane Creek building wheels. I worked a US Pro pit, wrenching on Rebecca Rusch’s bike the first year she was going after the World Championship. Now I’m out of the “trenches” and I’m using my wealth of cycling knowledge for women and anyone wanting to learn about cycling that might be scared of their local bike shop and the egos flying around. I work full time in a marketing agency, removed from the bike industry, but I ride a ton more than I have ever before and I’m experiencing cycling from both ends as a consumer and an industry friend. What inspired you to start Bike Shop Girl and what have you hoped to accomplish with the site? Two summers ago I was running a well known bike shop in Charlotte, NC. We were proud of our high end bikes, bike fitting and service for women. I was the only full-time woman in our two location, 20-25 employee company and I was doing a ton of bike fits. We did a standard bike fit everytime we sold a road bike, and I ended up doing a re-fit on a woman that purchased a bike 3 months earlier. She had requested being fit by a woman. While going through the standard fit questions she mentioned she had been “numb” in areas you don’t want to be numb for 4 weeks and had gone to a doctor the week prior. I was shocked. I asked her how she’d let this happen and she said she asked her male friends about discomfort and they told her that she would get used to riding. YOU SHOULD NEVER GO NUMB PEOPLE! It should never hurt to pee! I walked away frustrated. Our shop is one of the best in the area. We did fitting very well and had a great female clientele, yet somehow this happened. This woman didn’t know how to ask the right question, she didn’t feel comfortable to ask that question. Moral of the story, I wanted to provide a virtual space–whether on Twitter, Facebook, or the blog–that you can come to, ask difficult questions, and get an answer without someone rolling their eyes at you. Along those lines, your mission statement is to “empower women in cycling.” How have you worked to accomplish that? What sort of barriers do you see facing women both in racing and in riding for transportation? 1) em:pwr cycling club to bring like minded people together. For those that want to ring the cowbell and get more butts on bikes! Bike shops are scary. Most bike shops are laid out weird (making it hard to find things), not inviting, dark, or have either really PUSHY sales guys or lack any customer skills. People want to be empowered to help themselves. That’s what I’m here for. Not to disregard the LBS, but to help that person before they walk in so they have some direction. Too many options. I love options, but I know what I’m looking at. Too many options are overwhelming and can make someone feel inferior. Do not make your customer feel inferior, they will go and shop from their underwear at home. The boys club. I’ve been riding for over 12 years in groups. I can hang with the boys and talk smack with the best of them. I still hate rolling up to a group I don’t know and not seeing one smile or friendly chatter. Get off your high horse and be welcoming to strangers. It seems like all odds are against independent local bike shops with a down economy and heavy competition from the big-box retailers like Performance, online shops, eBay and overseas gray-market sellers, etc. As a former shop manager, what are your thoughts on the longevity of the LBS? Is the LBS business model going to have to change drastically for them to survive? I believe strongly that the LBS business model needs to change. Two words. Service and community. Service = mechanics, fitting, fountain of knowledge. Community = Become involved with your community, create a venue for cycling. Neither of those things can be replaced by the Internet. I look at the automobile industry for example. How many specialized service shops do you see? A ton. People want to work with those they trust, be trustworthy and valuable. Now that I’m an “outsider” from the bike shop I can say I’ve gone and checked out shops, because I still love the LBS. I can easily see why people get turned off. No greetings, messes, hard to find product, and you ask the mechanic a question and they act like you are bothering them. I know you were hit by a car while riding last fall and the experience was (understandably!) traumatic. Was it difficult to start riding again once you were physically capable? If so, how did you overcome the mental block and get back on the road? Oh boy, yes. Let me begin by saying this was not the first time I was hit. It was the first time in many years and the first time I can say I couldn’t have done anything different. A few things happened quickly after the accident. I sold CommuteByBike.com and purchased a car. A month or so after, I started mountain biking as much as I could. It was a good 3 months before I was back on the road, and a month after that before I felt comfortable again on the road. Looking back, there still wasn’t anything I could do differently BUT I know things to do now if I’m hit or in that situation again. Thanks to an outpouring of support from people in the cycling culture sending daily tweets, emails, notes and whatnot, I was able to overcome the mental block. Barb Chamberlain started a hash tag, #youcanride, for whenever she and friends would ride so I would see how much fun they were having when riding. Cycling is a part of me, and it will take more than a car accident to remove it from my life. Since getting hit is the occasional and unfortunate reality of sharing the road with cars, do you have any advice that might be valuable to other cyclists who find themselves in a similar situation? If there are witnesses get their names and numbers. Hold on to your valuables so they don’t go missing. Have someone take as many photos as possible. Stay on insurance (I’m still dealing with it now) and stay positive. You are alive. This entry was posted in Advocacy, Bike Industry, Interviews, Mechanics, Mountain Biking and tagged arleigh jenkins, barriers for women in cycling, bike shop girl, commute by bike, the future of local bike shops, women and cycling. Bookmark the permalink.